Pilla's DS Agents – Page 2 – Pilla's blog: Creatures Docking Station metarooms, tools, agents and more! LOOK AT THIS PRETTY ART! Civvi’s norn, Milk, with my dragon Pearl. On another note: Ham5ter announced he’ll take up the Albianwarp development again. For updates you can check in at the Caos Coding Cave‘s #AlbianWarp channel. Sometimes, cool streams are happening! Malkin approached me on Discord, asking me how to pick a random letter. I’ve been using random numbers in CAOS with the RAND command for like forever, but I hadn’t found a reason yet to pick random letters. The question made me think, though. Of course, there’s the old-fashioned, boring and bulky-code-way of just picking a random number between 1 and number-of-letters-in-the-alphabet. 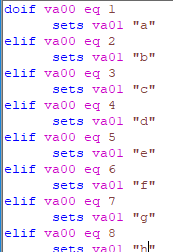 Then you can set a variable to a letter depending on the value of that number, in an if-elif-elif-elif-elif-… scenario. Surely there should be a cleaner/easier way! Recently I learned more about the CHAR variable thanks to Amaikokonut’s blog post over at Naturing :: Nurturing. I noticed char has two commands, one that returns a variable and one that sets a variable. The command returning the character returns the ASCII number for that character. I wondered if the one setting a variable also uses the ASCII code for a character: Yup! So, all that’s left is to figure out the ASCII numbers of the characters you want to use. For the characters A to Z, that’s 65 to 90. For the characters a to z, that’s 97 to 122. I’ve been feeling artsy lately. Now, I would like more pretty buttons but I can’t seem to find many linkback buttons to sites that are still active, therefore I offer to create a button for your website! [CCSF 2018] The CCSF Preliminary Forum is up! And icons! The preliminary discussion for CCSF 2018 has been created. Here you can see the results of the survey and post your own ideas! You can discuss and team up with other members to make this year’s CCSF a succes. Register an account and join the community, make the CCSF 2018 come true! Do I need to say more? Make an account, I’ll see you there. Let’s have a wonderful year together with the community! May you have a great year, filled with love, warmth, health and happiness. And of course, a healthy dose of Creatures! Minus the wallbonking. [Blog] A new metaroom… Maybe? Sooooo, yeah, I feel like developing a new metaroom. A giant metaroom with two or three or four levels and aquatic space and stuff. I want everything in the metaroom to change with the seasons and the time of day, so it would be using a very responsive background and stuff. Resource-heavy stuff, yay!